Please order with confidence: your satisfaction is our number one priority! Origin and 1st appearance of Thor (Doctor Don Blake). 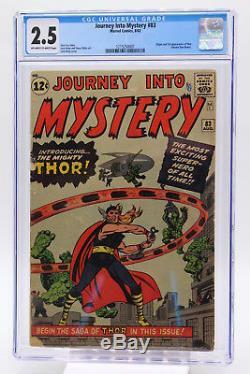 The item "Journey Into Mystery #83 CGC 2.5 Origin & 1st Appearance Thor Blue Label" is in sale since Wednesday, October 24, 2018. This item is in the category "Collectibles\Comics\Silver Age (1956-69)\Other Silver Age Comics". The seller is "internationalcollectiblesexchange" and is located in Hamilton. This item can be shipped to Canada, United States.